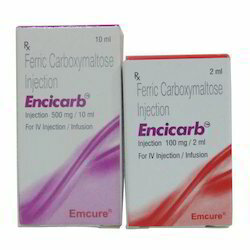 Wholesale Trader of a wide range of products which include cresp 40 injection, mycept 500 mg tablets, cresp 100, dargen 40 tablets, myfortic 360 mg tablet and encicarb injection. 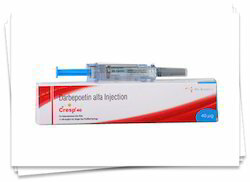 Cresp 40 mcg injection belongs to a class of haematological agents called erythropoeisis stimulating agents (ESAs). It is a synthetic form of a human hormone (erythropoietin) produced by recombinant DNA technology, which increases the red blood cell production thereby helping in relieving the symptoms. 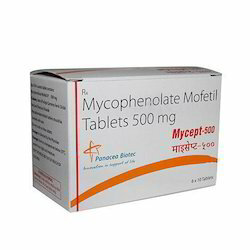 Mycept 500 mg tablet suppresses the activity of body's immune system and prevents rejection of the transplanted organ. 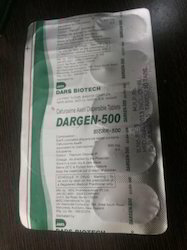 Dargen 40 mcg prefilled syringe belongs to a class of haematological agents called erythropoeisis stimulating agents (ESAs). It is a synthetic form of a human hormone (erythropoietin) produced by recombinant DNA technology, which increases the red blood cell production thereby helping in relieving the symptoms. 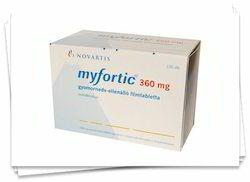 Myfortic 360 mg tablet suppresses the activity of body's immune system and prevents rejection of the transplanted organ. Iron preparations belong to a group of medicines called antianemics, and iron supplements. Iron is essential for formation of hemoglobin (substance that carries oxygen and gives blood its red color) and myoglobin (muscle protein that provides oxygen to functioning muscles), and for the oxidative processes of tissues (to transport oxygen to various tissues) in our body. It also supports functioning of several essential enzymes, neutrophils and plays important role in metabolism. Looking for Kidney Medicines ?